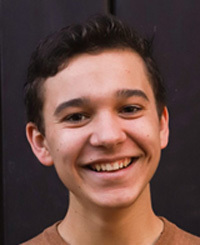 Jacob Reed, now 17, exhibited his remarkable music talent at a very early age. One summer at the age of six, Jacob taught himself to read music and play the piano. When he was 11, he taught himself to play the cello by watching YouTube videos of famous cellists. He began his formal musical training in 2015 with Eric Sung at the San Francisco Conservatory of Music. Jacob now is Associate Principal Cellist in the prestigious San Francisco Symphony Youth Orchestra and is also a member of the Young Chamber Musicians in Burlingame. He has twice appeared on NPR’s From the Top, including a music video with the classical/jazz/big band fusion ensemble Pink Martini. This past summer was his first time away from home on his own, when he spent eight weeks at the famed Tanglewood Music Institute, sponsored by the Boston Symphony, which provides an intensive summer training opportunity for exceptional young music students. Jacob’s talent was recognized by his being named Principal Cellist in the Tanglewood Youth Orchestra. Jacob, the fourth of six children, is a junior at Monte Vista High School in Danville. He plans to study music after he graduates. Jacob’s talents include singing. He says that his favorite class is choir, which is taught by his mother, Jodi Reed. Jacob will be travelling to New York in the spring of 2019 with the Monte Vista Concert Choir to perform in Carnegie Hall. In the summer, he will travel with the San Francisco Symphony Youth Orchestra on their European tour. In addition to school and cello practice, Jacob loves listening to NPR’s Says You and Car Talk radio programs, solving Rubik’s cubes, playing racquetball and composing music.